NEWINGTON - Tailoring is a highly valued trade and a service becoming more and more difficult to find. Newington resident Loy Ferguson brought her talent to the U.S. from Brazil, and she’s hoping to offer the service and teach the trade at a new shop and school opening this August. Loy’s Tailoring will be open for business and pleasure at 786 Silas Deane Highway in Wethersfield on Monday, Aug. 6, with classes following a few weeks later. “When you do something you love, you do it by your heart,” says the 57-year-old Ferguson, a world traveler who picked up creative techniques and inspiration in different countries she’s visited. Mending, creating and transforming fabric items was a skill she learned as a child in Brazil. “When I was eight or nine years old, I would sit on the floor and watch my mom sew my dolls,” she remembers. 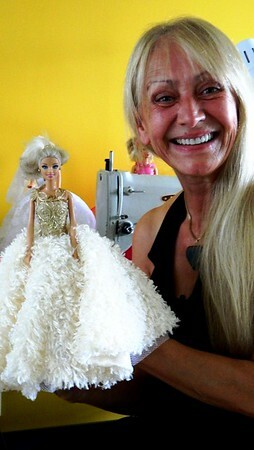 Soon she was making her dolls intricate gowns, a hobby that has stayed with her all these years later. Ferguson studied art at the Facilidad de Artes Dulcina de Moraes. It was during a trip she took to the U.S. over 12 years ago that she met her husband, Rod Ferguson. They have been married for 10 years and share a home in Newington. Ferguson has earned a reputation in the Hartford area for her designs and tailoring skills, honed while working at Nordstrom and French Cleaners. Tailors are in high demand at department stores, bridal boutiques and dry cleaners, where customers often ask for clothing to be mended or altered. That’s why Ferguson hopes to attract students of fashion design, homemakers and really anybody who has a desire to learn the trade. And she’ll also teach - a beginners class and one for more advanced learners working toward a professional goal. Ferguson speaks English, Spanish, Portuguese and some Italian. She fixes everything from boat seat cushions to curtains and prom dresses. She transforms old, vintage items into unique new pieces. She can create doll dresses, dog outfits and everything in between. Posted in New Britain Herald, Newington on Sunday, 29 July 2018 21:15. Updated: Sunday, 29 July 2018 21:17.